We are pleased to announce that Saint Leonard’s Parish Church Loftus will be open on Saturday 13th September 2014 from 10:30 am to 4:00 pm as part of Heritage Open Day 2014. As well as being able to see the beauties of St Leonard’s Parish Church Loftus, visitors will also be able to see some of the old parish registers, which will be on display. Visitors will see the Baptism Register containing the record of the baptism of the geologist Lewis Hunton (1814-1838) who was baptised at Saint Leonard’s Loftus on 6th August 1814. 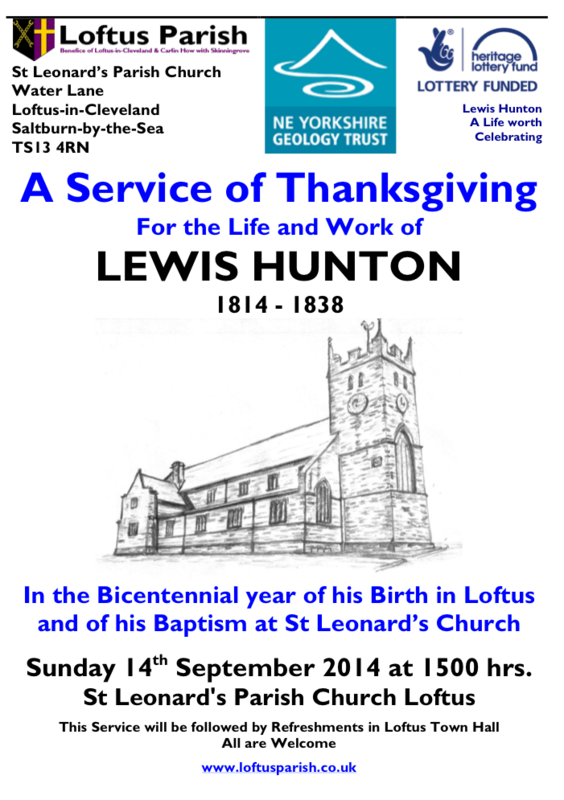 On Sunday 14th September 2014 at 3:00 pm the community will celebrate the life and work of the Loftus geologist Lewis Hunton with a special Service of Thanksgiving.